Airline Operations and Delay Management fills a gap within the area of airline schedule planning by addressing the close relationships between network development, economic driving forces, schedule demands and operational complexity. The pursuit of robust airline scheduling and reliable airline operations is discussed in light of the future trends of airline scheduling and technology applications in airline operations. The book extensively explores the subject from the perspectives of airline economics, airline network development and airline scheduling practices. Many operational issues and problems are the inevitable consequences of airline network development and scheduling philosophy, so a wide perspective is essential to address airline operations in their proper context. The influence of airline network development on schedule planning and operations driven by economic forces and relaxed regulations is thoroughly examined for different types of operations in aviation such as network carriers and low-cost carriers. The advantages and disadvantages of running different networks and schedules are discussed and illustrated with real airline examples. 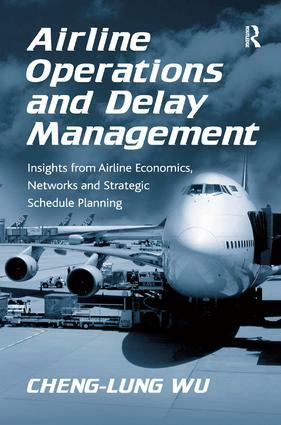 In addition, this book provides readers with various mathematical models for solving different issues in airline operations and delay management. Airline Operations and Delay Management is ideal for senior undergraduate students as an introductory book on airline operations. The more advanced materials included in this book regarding modeling airline operations are suitable for postgraduate students, advanced readers and professionals interested in modeling and solving airline operational problems. Dr Cheng-Lung (Richard) Wu is a Senior Lecturer with the Department of Aviation at the University of New South Wales in Sydney, Australia. He obtained his PhD from Loughborough University, UK, in 2001. Since then Cheng-Lung has devoted much of his time to the subjects of airline operations, schedule planning/optimization, and delay/operations modeling, both through his research and also consulting for several major airlines. Cheng-Lung also publishes extensively in major air transport journals, such as the Journal of Air Transport Management and Transportation Planning and Technology, and is an editorial board member of the World Review of Intermodal Transportation Research and the International Journal of Aviation Management.